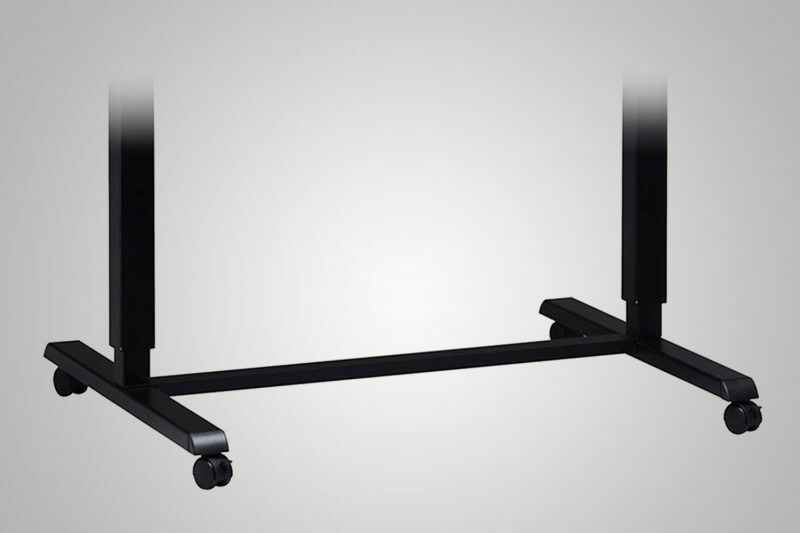 View cart “Black Large Standing Desk Top 29” x 57” x 3/4”” has been added to your cart. 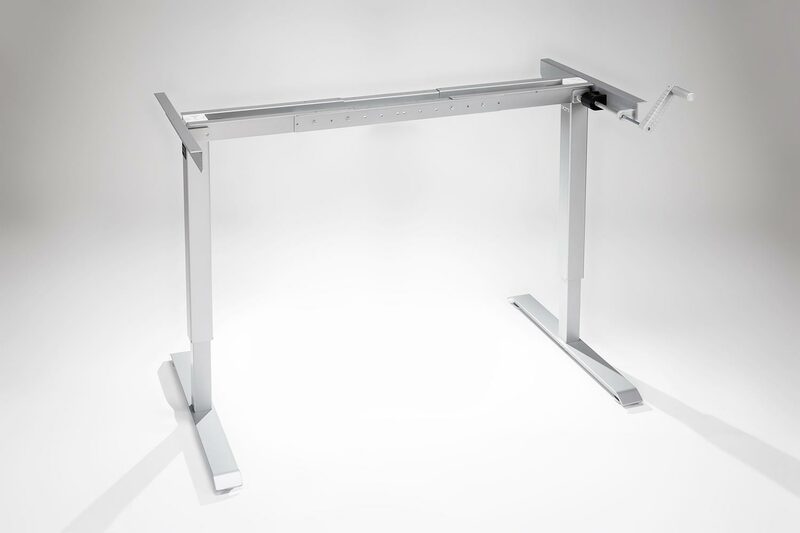 The MultiTable® ModTable Hand Crank Standing Desk is the culmination of years of research and experience dedicated to designing a truly great height adjustable workstation. 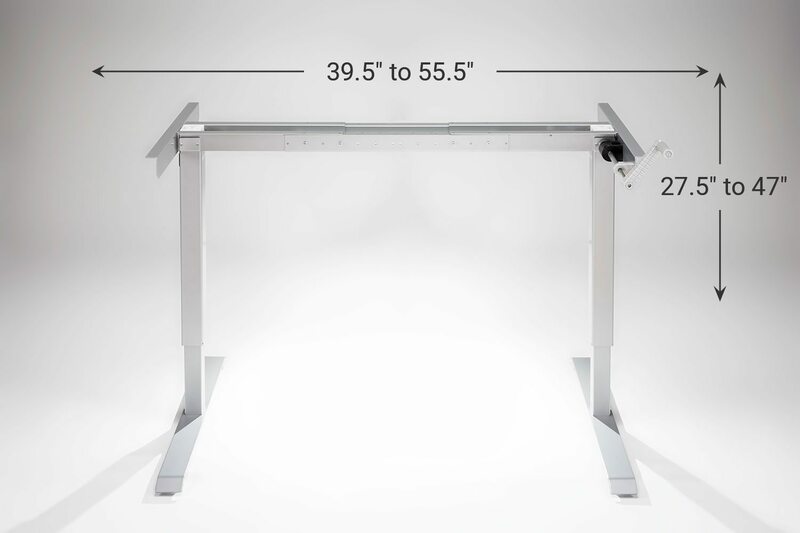 Known best for its improved handling, increased durability and undeniable versatility, the human-powered ModTable Hand Crank Standing Desk is not dependent on electricity to raise or lower. 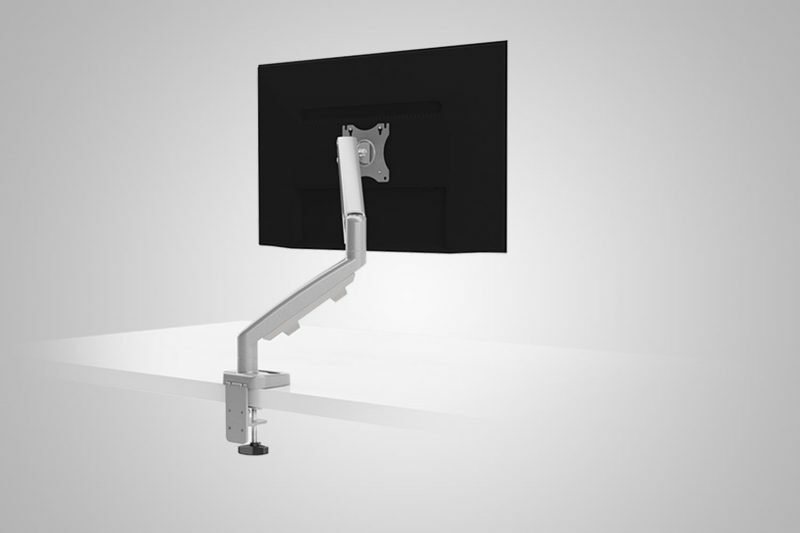 Just two turns of the handle raises or lowers the desk by one inch, enabling you to adjust your entire desk surface to your ideal height. 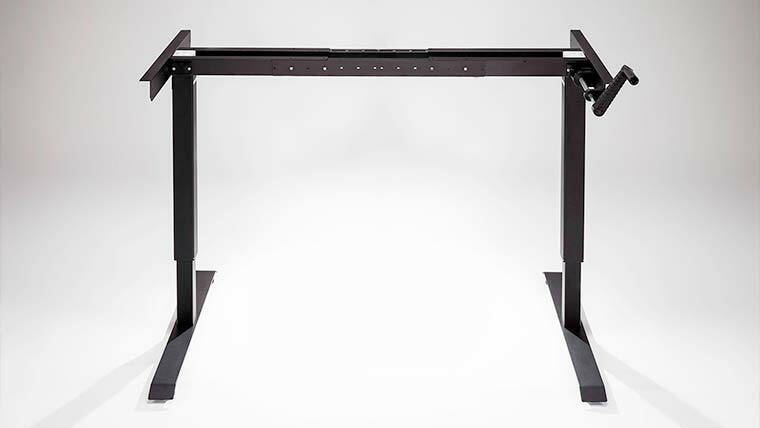 The ModTable Hand Crank Standing Desk Frame is constructed from roll-stamped, premium-grade steel that has been tested countless times for endurance and reliability. 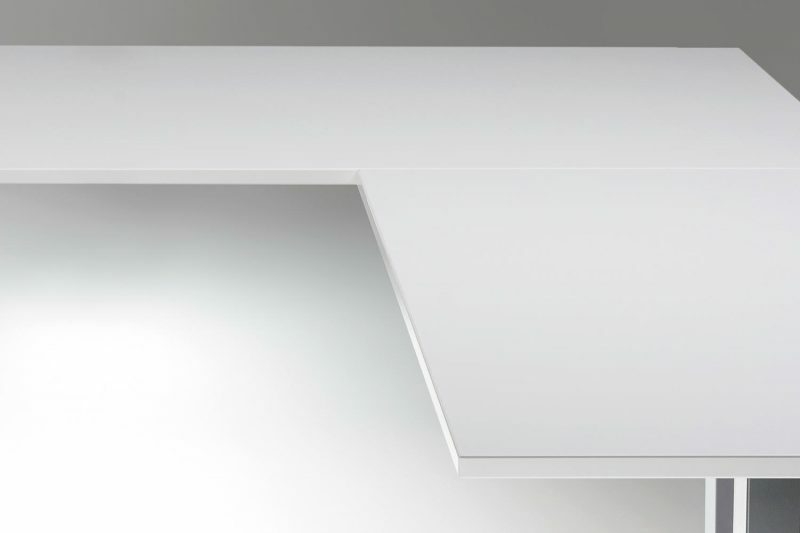 This robust manual design enables you to not only adjust for height, but also to move freely from room to room. Simply attach an optional wheel kit upgrade to the frame legs and give yourself the freedom to take your work to new heights wherever you choose to go. Achieve a healthier, more balanced working lifestyle when you get a handle on your day (and your desk) with MultiTable. Are You Kidding Me?? I can not believe the table I just bought. I got it yesterday and all I can say is……this is the greatest thing since sliced bread! My legs are already saying thank you. LOL. The quality of this table is above excellent. The mechanisms are all top notch. And the ease of use is beyond belief. I wish I would have known about this a long time ago. Thanks so much for your great service and quality product. I am so glad I have this. Highly Recommend! I love my MultiTable and working standing up. I feel so much better than when I sat all day. I recommend MultiTable to everyone I know who works at a desk. I'm standing at mine now!! Very Happy! I'm VERY HAPPY with the table. It is easy to crank up and down. I was worried that it might be difficult to crank. I was able to work comfortably on Friday and put in a 10 hour day. Sitting for 10 hours was becoming quite grueling. So, YAY! This is starting out GOOD. Exceeded Expectations Just put the table frame together. It exceeds my expectations. I appreciate how sturdy it is. Thanks very much! Perfect for sit to stand This table base arrived very well packaged and was a snap for me to put together by myself. The components are very well constructed (all metal except for the plastic gear and handle). All the screws lined up well. The crank works smoothly and the height variation is perfect for sit to stand. I would definitely recommend this product to anyone looking for a manually adjustable table! No Duck Duck Goose in my office After visiting Dwell convention in Los Angeles and visiting their booth some years back, I've drooled and dreamed over the thought of owning my very own crankfest turbo desk! The treadmill seemed pretty hokey, but it grabbed the attention at least. Due to the numerous benefits, I haven't had a normal sit down desk in a few years. Along my path of transition, I tried a few cheap alternatives...desks that never achieved a proper height needed (not super tall, but at 6'2 I found hunching would be needed), desks that wobbled more than Gilligan at the helm of the S.S. Minnow or desks that were just ultimately a basic hazard (stacked bricks sans mortar ftw). I finally accepted the fact that I needed to pay some decent coin for a well made product. Shut up and review. Well made steel frame, no wobbles, easy to adjust up and down (even with loaded weight of 27" monitors and Cintiq tablet). I was concerned it would be a little top heavy at max height...nope ! I paired this with a solid wood top from IKEA (69.99 for solid wood is a great deal) and now have a desk I will have for many, many years with any luck. Please note, Multitable's tops are laminate cores...this is why I went with solid wood. I have a lot of heavy, sharp and tool'ish stuff in my office so I am always looking at durability first. I won't get into all the health benefits of standing while you work (I believe in your ability to googles), but I will say this...I most enjoy being able to booty shake while tweaking my nurbs and vector paths without needing to hunch over. That's reason alone for 5 stars in my book. Nailed it! My hand-cranked MultiTable setup is an elegant solution, at a good price point for the home office. "Elegant" is defined as "pleasingly graceful and stylish in appearance or manner," and of a solution to a problem as "pleasingly ingenious and simple." I think MultiTable has nailed that. Finally I can stand! I am a graphic designer and spend a great deal of time at the computer. A little over a year ago, my knees and left sciatic nerve reached their limits for abuse and sitting became absolutely miserable. Being able to work standing as well as sitting (and walking) has made a world of difference in my life. Physical therapy exercises have me on the mend, and my ergonomic workstation has made work a pleasure again! Wonderful Table Legs Wonderful table legs. 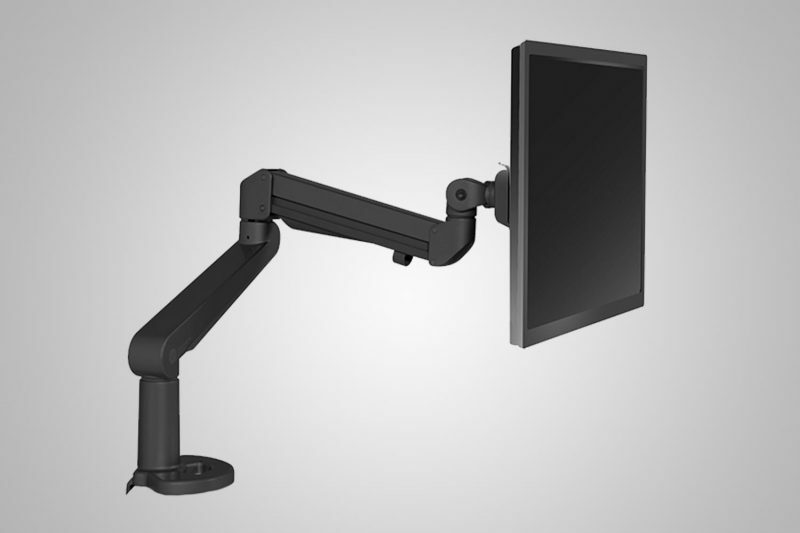 This unit adjusts easily, silently and smoothly. I had a maple table top made for this unit to use as an adjustable sewing/cutting table. It's terrific. My second MultiTable Desk! My back and hips get tight and quite sore if I work in a sitting position for too long and, my feet don't like standing all day either. 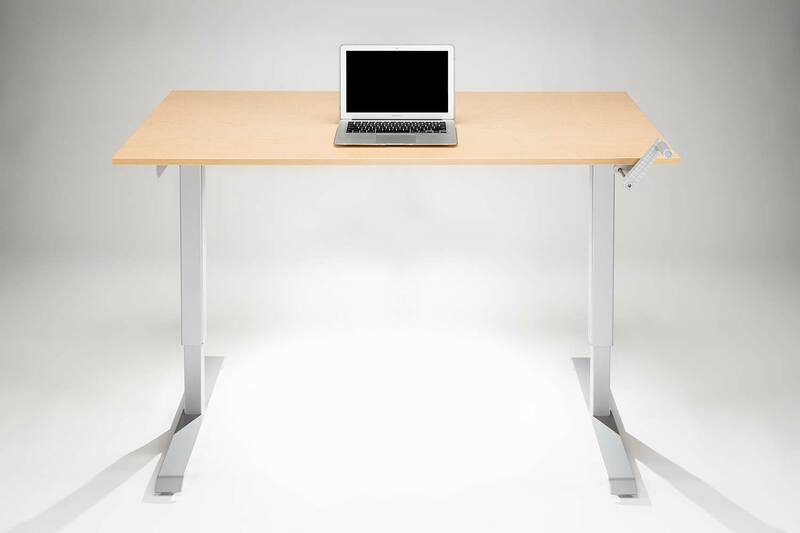 A mix of sitting and standing is perfect and your MultiTable desk allows me to do that easily. I ordered a second desk so that I can work at my computer at one of them and spread my research notes and sample drafts out on the other one...wonderful! Brilliant! Just set up my new desk and i love it! Quite easy to assemble - I did it mainly by myself. This desk is high quality and so easy to operate. Worth it! Perfect for an office desk Assembly was fairly straight forward. Give yourself an hour or so. I had difficulty tightening one of the two set screws. The supplied allen wrench was barely strong enough and bending while trying to tighten the set screw. I’m using this for an office desk with a 2ft x 5ft table top. I have a dual monitor stand clamped to the back edge of the table supporting 27” monitors. 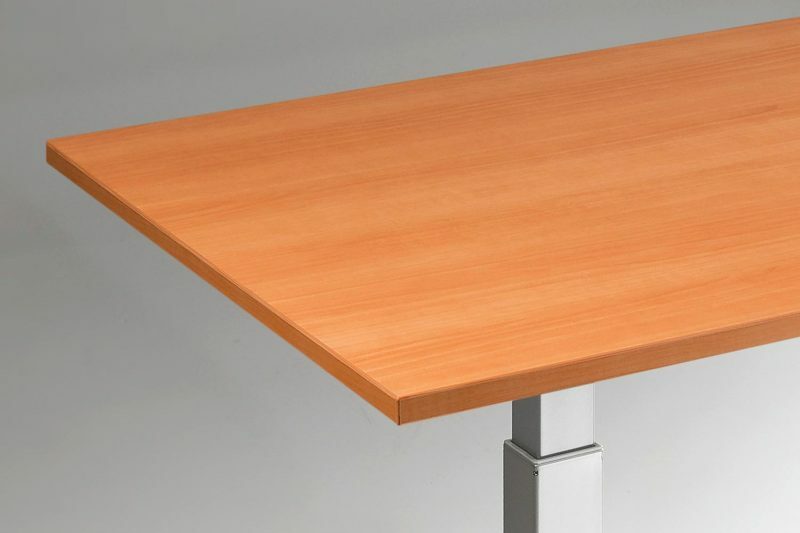 I find the base to be very stable in a raised position and can comfortably lean forward against the table top without the whole setup shaking. 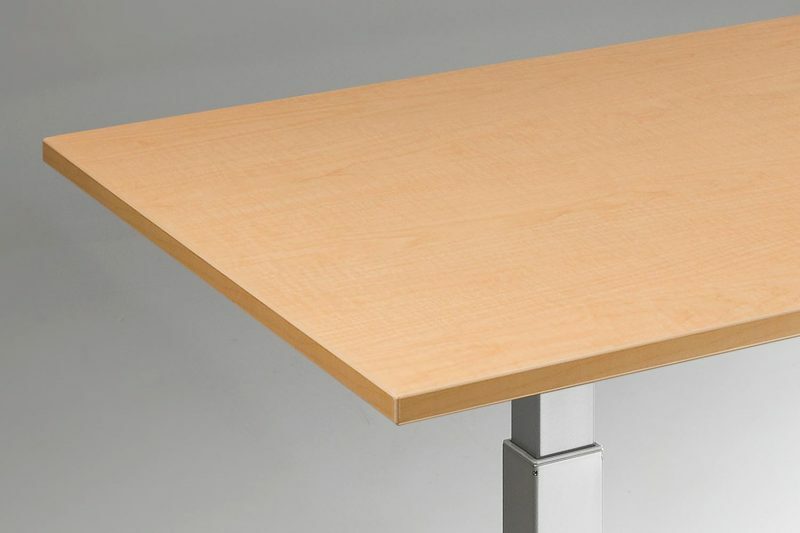 If someone bumps the table, the setup will shake, but it is very sturdy and nothing to worry about. Raising and lowering the stand with one hand is very easy. I estimate that my base is supporting around 100 lbs. The only concern I have is how long the plastic gear will hold up. 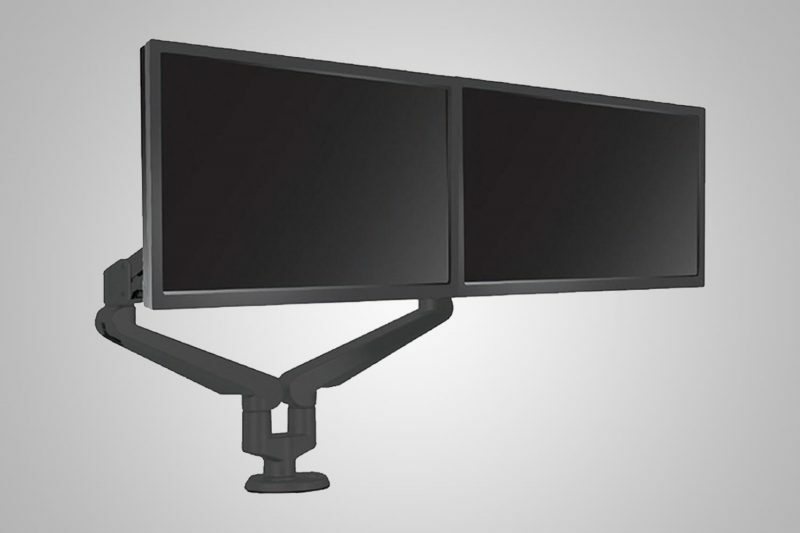 Great for Apple Thunderbolt Display Its a really, really nice desk. Very sturdy. Very clean looking. Perfect size for my Apple thunderbolt display and macbook pro. Cranks up and down easily and it moves quick enough. It was easy enough to put together and the directions were very well written. I really like this stand I really like this stand. I bought my table top from Ikea for cheap! If you have an Ikea nearby, that's the best way to do it. I'm using it right now as I write this. It's easy to move up and down. It can accommodate many different table sizes and wasn't too hard to put together. The instructions were good enough and took about a "distracted" hour to setup. Love it Love it. I also have a Jarvis electronic standing desk from Ergodepot. This is very comparable. Overall, I think I would give a TINY edge to the Jarvis because I prefer the electronic mechanism over the crank, but this desk is great and I think anybody who purchases it will be very happy. Great Service! The desk arrived with damage to the top. I notified the company and sent them some pictures, and they sent a replacement out that day. Great service! I received the new top and having been using it ever since. I wasn't sure the desk that the raising mechanism was going to be smooth enough for me to have my two monitors close to the back of the desk without something to prevent them from falling off. The mechanism is so smooth and the desk is so sturdy. I haven't had any problems, and I raise and lower the desk a few times a day. Great as a treadmill desk The hand crank allows me to easily adjust the desk height by myself to exactly the right ergonomic height. I put a top on this table for $26 from IKEA. I use this desk with the LifeSpan treadmill and it is very stable - no wobbling even while I walk and type. I'm completely satisfied with how this desk works w/ my treadmill. Great Quality I found this product through an article online, and I am glad I did because I've been looking for a good standing desk. In the future, I would just buy the base and create my own table top. Excellent product. Works Great This adjustable desk is pretty easy to assemble and is very easy to adjust the height to whatever you want it to be. I've bought two, one with the top that comes with it, and one with a separate 2" butcher block wood top from granger. Outstanding! 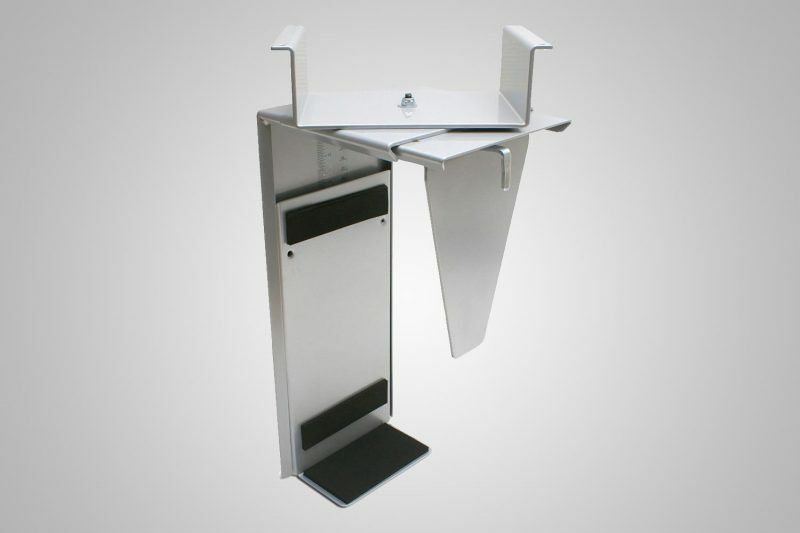 Kudos to MultiTable Solid, well conceived and engineered standing desk frame. This is not a cheap piece of machinery. Instructions were clear and concise and components were simple yet made of high quality materials. I would recommend this desk frame highly. A year after... I have had this table for a year and decided its about time to write a well deserved five star review.I got mine directly from MultiTable since amazon didn't carry the XL (72”) top at that time. First and foremost, the item was very well packaged. I actually saved some of the packaging and used it during my move to a new home recently, to protect the table top edges.The surface does not scratch that easily due to things like keys etc. Assembly was easy as well. I use it in my home office for computer work. 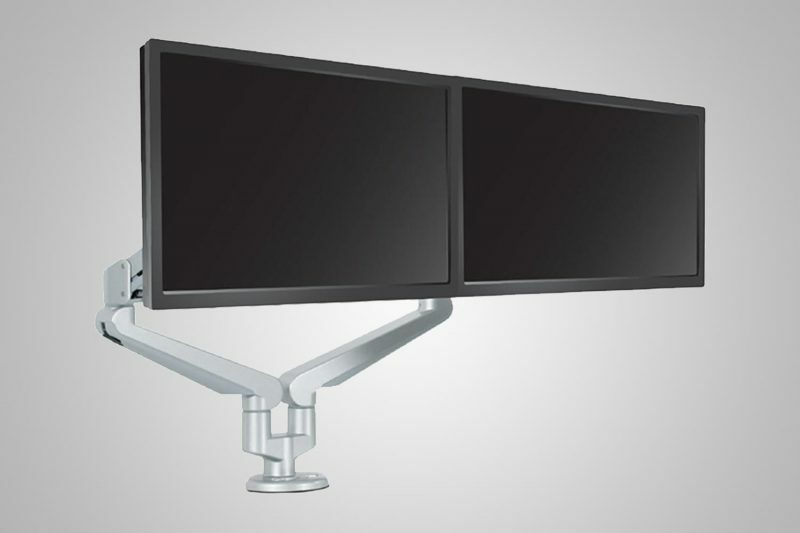 I have installed an ergotron LX Dual Side-by-Side monitor that holds my two LCD monitors. 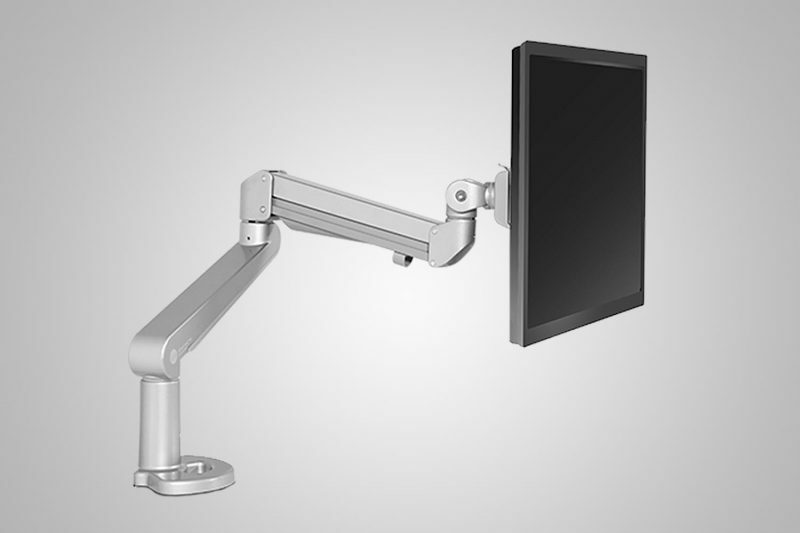 I also had a tyke supply monitor arm (heavier) to mount a third monitor for a while. I was careful not to go over the recommended weight capacity. The base is solidly built but I suggest you watch the weight on the table before you start cranking. I work from home most days and regularly adjust the height. It has held up very well so far. No complaints. Sure there is some occasional wobbling as other reviewers mentioned but it doesn't bother me, definitely not when typing. I highly recommend this well constructed table as it promotes a better posture and blood circulation etc. when working for long hours. Well designed & easy to assemble Very sturdy desk and engineered with great precision. Directions were easy to follow and assembly was simple. I'm not mechanically inclined and I assembled the table in around an hour. Highly recommend this desk. LA Consumer Love it!!!! Very easy to raise and lower. Also really easy to assemble. If you have reasonable coordination, one person can assembly this on their own. 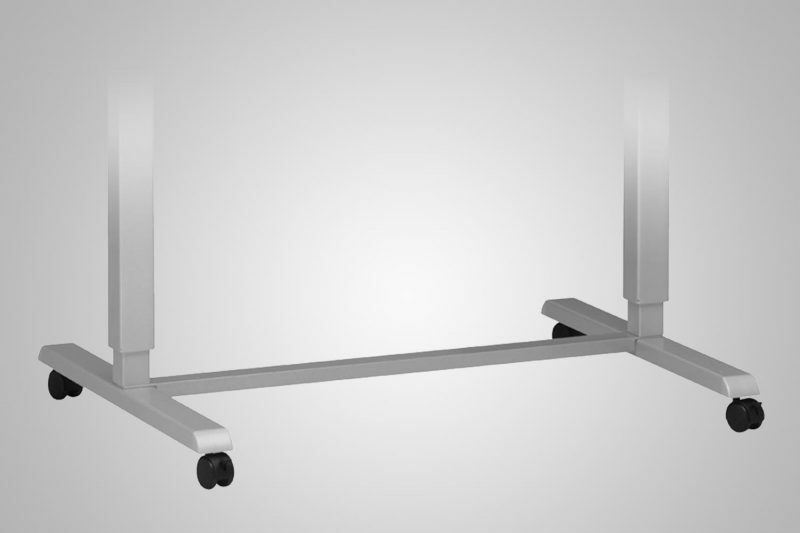 Good table Works well and is pretty sturdy, great for a standing workstation. I am buying another one to make a corner workspace. Five Stars from an Architect What can I say other than the product fits my needs perfectly. I love it. The table legs arrive is a study, professionally-packaged cardboard box, A great start. Pretty easy to assemble, high-quality fasteners and finish on the legs. It takes a good hour to unpack and assemble and some additional time to fasten a table top on it. As long as you tighten the bolts properly, the legs are very sturdy, even when I raise the table a good 4 ft. AFF. Think of starting an old jalopy when you use the crank mechanism. So five stars to MultiTable!. Great Adjustable Desk Considering that I spend most of my time on the treadmill, the need to adjust the desk is much less and choosing the manual crank was the right way to go. This desk is solid and stable. Highly recommended. I'm glad I bought this desk I bought this desk for daily computer work. 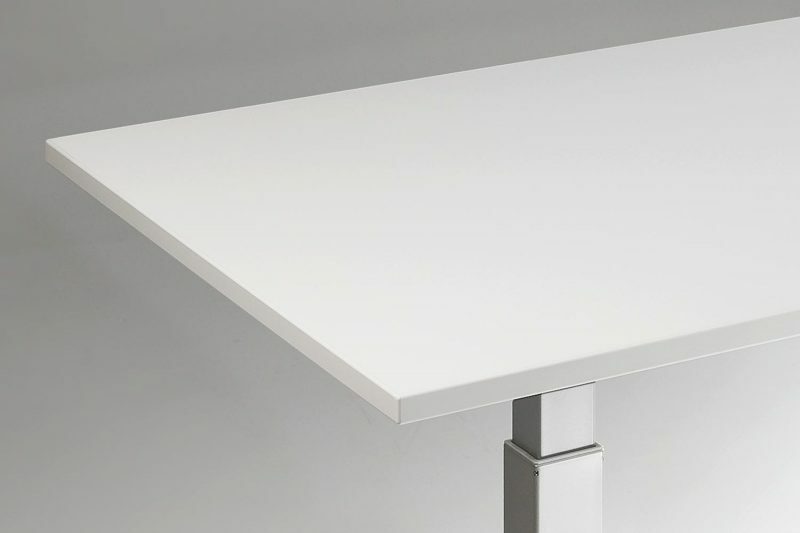 The height is infinitely adjustable, the tabletop size is perfect for what I need. The only downside is that the black top does show fingerprints. Stand Up! I decided I wanted the option to stand at my work desk, where I'm on the computer for hours and hours a day. After considering DYI'ing something (lots of plans online if you look for ergonomic/sit-stand desks), I kept coming back to this base on Amazon. I decided the cost was worth the investment (I bought this for myself to use at work, after failing to get approval for my employer to pay for something like it), and ordered this base. I got it in two days (Amazon does not play around with the Prime 2 Day shipping). Dismantling my old wooden desk (they put those things together well, let me tell you) and keeping that top, which is 60" x 34" (and pretty heavy), I assembled this base by myself in about an hour (wasn't too bad, instructions are straight forward and tools are included) and mounted my old wooden desktop on it (that was less easy, solo). Mounting screws for the desktop came with the base, and presto, I had an adjustable desk! 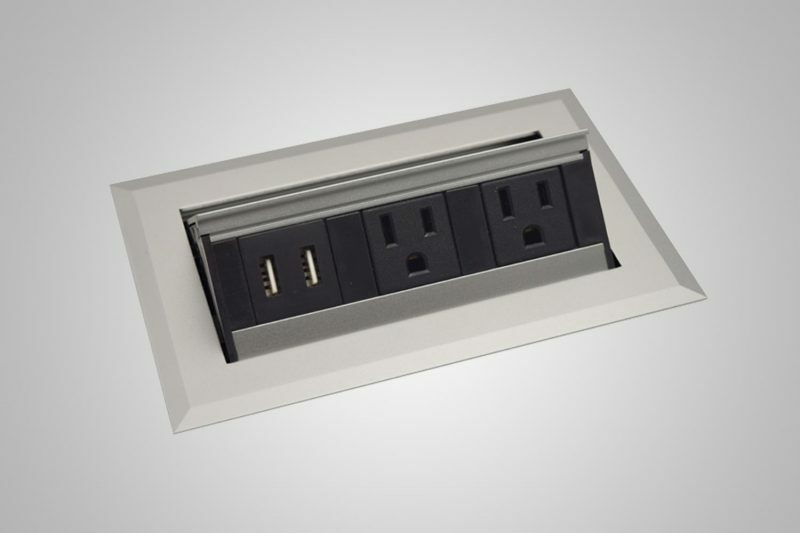 Now I did lose all of the storage space I had in my old desk, and you need to factor in the space/distance from walls, length of power and ethernet cords, etc when it comes to adjusting the height of the desk. While cranking the desk up and down takes a little effort, it's plenty manageable, and I actually find myself rarely sitting at it now (I've used it at work for nearly two months now). But, I'm glad it is adjustable, as it's very fine-tunable. I got an anti-fatigue mat to stand on at my desk, and for that I adjusted the heigh up maybe and inch or so. So, if you're considering an adjustable height desk, this base makes it pretty easy to make it happen, for a reasonable price too. Great Table Nice and heavy. 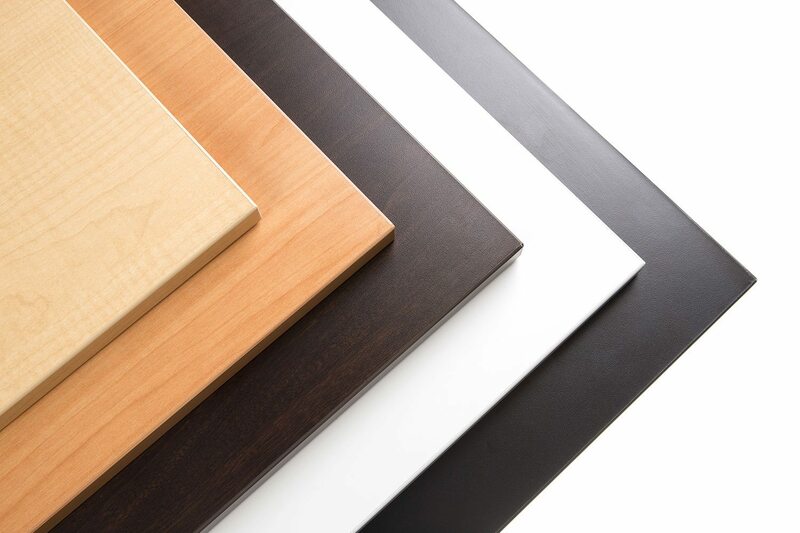 Good materials and well finished. Easy assembly and everything lines up well. I guess for $800 it should do all these things, but craftsmanship seems to be dead for most products. Also, I had a top damaged during shipment and their customer service was courteous and prompt. No issues at all. Would definitely purchase another one. So far so good I'll be up front with my concern - the gears used in the lift mechanism are plastic. So we'll see if they stand the test of time. This is a very well made unit. Everything fit together with no forcing. The lift is smooth and easy. I think it is a great value. If you are reading this review, you know you need somethng that lets you stand part of the day. Rock Solid Flexibility at an Affordable Price Sitting behind a desk all day is not good for anyone, so the ability to switch quickly between standing and sitting is a real life saver. After plenty of research and sticker shock at the cost of adjustable work desks, I decided to give this manual ModTable a try. This base is rock solid. I have several monitors and my laptop atop the table along with the usual junk that inevitably accumulates and I have no problem raising and lowering the work surface. Everything simple moves up and down with the manual crank. It takes about 20 cranks in 20 seconds to move from my seated to my standing height, so I often switch between the two several times a day. I especially like to raise the work surface to the standing position in the afternoon when drowsiness sets in and makes it hard to stay focused otherwise. Rather than getting the bland laminate top, I purchased a solid hardwood table top from the local Swedish big box furniture store, which fit perfectly and makes for a beautiful adjustable desk. So good it hurts I bought this table because it was the cheapest sit/stand workstation I could find that looked like it could replace my sit down desk. My profession requires me to spend long hours at a computer with large monitors, and I cannot spend the whole time sitting without imperiling my health. Allow four weeks for delivery. Mine was promised for six weeks and came two weeks early. I was pleasantly surprised when the desk arrived in two neat boxes, and the top was light compared to the box with the base. The box with the base can give you a hernia. Do not move the box, rather have the nice UPS man with his hand truck put it inside your front door, open it, and then cart the pieces to your assembly area. You will need two people for the assembly, preferably neither one of them you. The assembly is straightforward. Also, the base is width adjustable. If you bought a pre-drilled table top, USE A TAPE MEASURE to measure the pre-drilled hole width in the top, and then make sure the mounting points in the base match this width. I of course did not do this and had the pleasure of loosening and then re-tightening the drive shaft. The thing is remarkably easy to raise and lower, there's two crank lengths, and you can simply slip the crank out if it's in the way. Only four stars because I just got it. I'll check back in a year or so and let you know how it's going. Follow-up, 2014-06-20: These beauties now ship from Arizona. Allow a mere 10 days for delivery to the continental USA. On the down side, the UPS humanoid is less than enthusiastic about moving this desktrocity into your domicile. On the up side, I figured out how to assemble it myself. On the down side, my programers want to start their own businesses. On the up side, none of them can afford a sweet setup like this. Seven stars. Finally pulled the string on this one a few weeks ago and couldn't be happier. This thing is rock solid I work from home on the computer every day, very long hours. Saw some reviews about the health benefits of the stand-up desk and have been wanting to give it a try for some time but hesitated because of the cost. Finally pulled the string on this one a few weeks ago and couldn't be happier. This thing is rock solid. I'm 6'2" and mine's raised to the max (47"). It doesn't wobble at ALL. Super easy to crank up and down, too, and the crank comes right out so you don't have to have it sticking out of your desk all the time. Just put it in a drawer. I grabbed an IKEA table top for $20 and am now incredibly happy with my new setup. Looking forward to seeing the health benefits. Great Product! 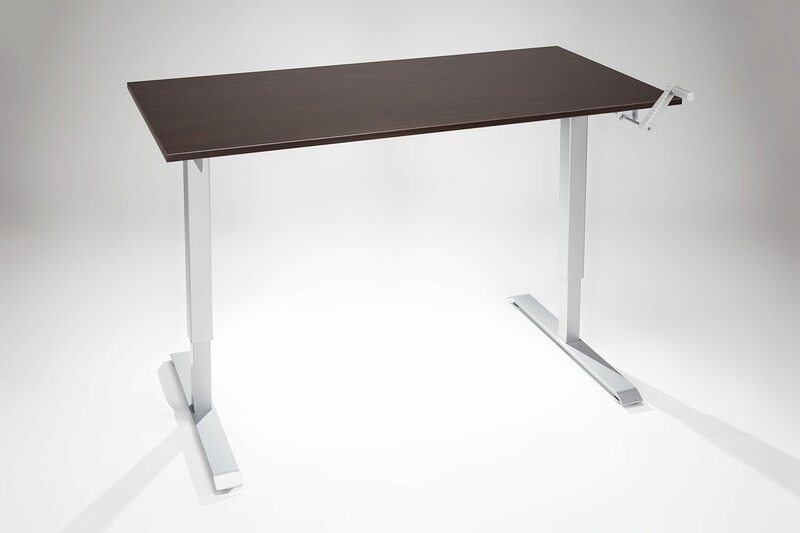 Anyone looking for a adjustable Height Desk go with this one! I'm a professional freelance graphic designer and I spend 10+ hours at home working. I decided to purchase this desk because sitting all day was horrible for my body. Now I stand 8 hours a day as I work and I love it! The desk is also very sturdy! It holds my 27" monitor, 17" laptop, my printer and other accessories. In my down time when I want to watch a movie all I do is lower the desk to coach level. I LOVE this desk I LOVE this desk! I got the wheel kit (another $70 on their site) so that I can get a change of scenery around the house. I know there are a bunch of expensive electric ones out there, but I'm always worried about the lifespan of things with too many moving parts. This is a simple mechanism that's easy to use. It only takes about 10 cranks to get it from sitting to standing. I'm honestly considering buying another one for my workplace. Great Table for the price This is my standing desk at home and it works great. It's quite sturdy. Not as sturdy as the standing desk I have in my office, but that one probably cost twice the price. It holds my 30" monitor without excessive wobble. Love it! This desk is just what I was looking for. Quality is very good, stable, looks good. Had someone put it together for me as am not good with that kind of thing. VERY happy with this purchase! Just what the doctor ordered For all you desk blobs out there who are killing yourselves sitting for hours on end -- you need this desk! My back and neck and head were revolting and I could feel myself slowing dying (no joke) -- chiropractors, massage therapists and even homemade remedies couldn't compensate for what I was doing to myself. I did a lot of research and found this adjustable desk and can now stand half the day (I alternate between sitting and standing.) You can buy just the stand and put your own desk top on it, or buy it with the desk top included. I got the extra large, 24 x 72 inch., top directly from the manufacturer. The base and top come in different colors and you can mix and match. Overall, I am very pleased and believe this will become an industry standard. 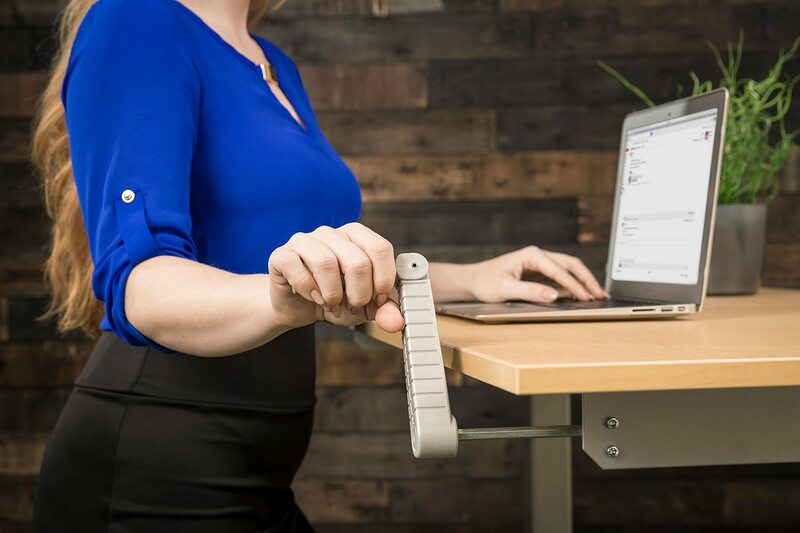 Millions of people are starting to feel the effects of sitting -- for years -- in the same position and this product will be a godsend to those need to stand and walk around. No, I'm not going to put a treadmill underneath it, but if you are that ambitious, you can! It takes about 45 minutes to assemble, customer service is great, and it is a solid product that should last for years. 5 stars! Exactly what I was looking for This table is exactly what I was looking for. I use it in stand-up mode about 99% of the time, but I still couldn't imagine not being able to crank it down. The only downside is the price. 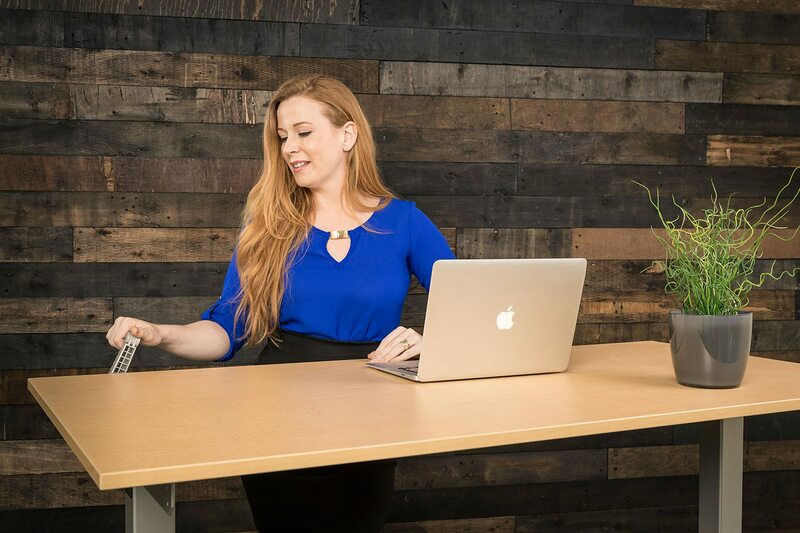 While still more affordable than other alternatives for adjustable standing desks, it is still more than most people would be willing to spend. I would buy it again in a heart beat. Assembling the desk alone is possible, but I'd recommend having a friend help you to make your life easier while putting the bases together. Only good things to say Unfortunately the first one I ordered arrived slightly damaged. The packaging is efficient, but the corners don't offer much protection if this heavy package is dropped on any of the corners. Assembly is pretty straight forward, the instructions were great. I got the black base, and the color is a solid black (the picture makes it look almost gunmetal gray). The crank mechanism works well, and while I was debating going with the electronic version, I'm happy I went with the manual version simply because of the cost savings. I don't adjust it at all as I bought it solely for a standing desk, I just couldn't find a desk with the exact height I needed. 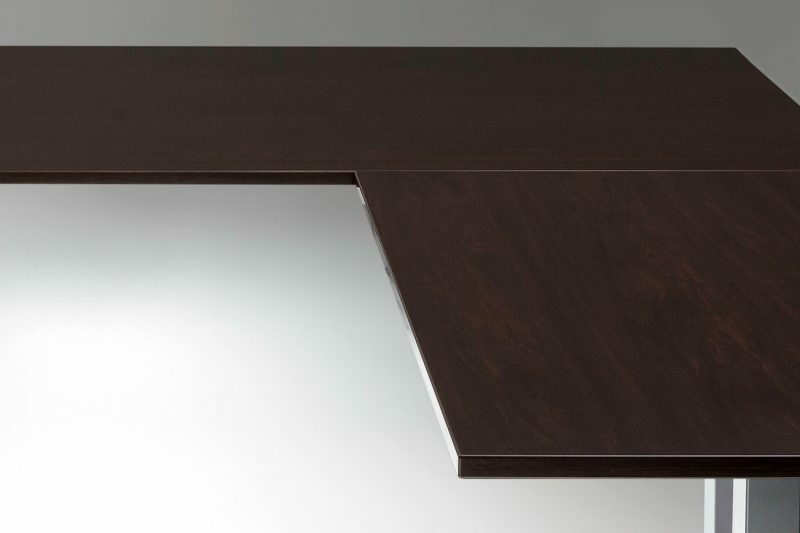 Other reviews say the table wobbles the higher it is lifted, but under normal use, it doesn't wobble at all for me. I use two monitors and raising/lowering the desk is very quiet - pretty much non-existent if you go slow. And for me it takes maybe 10-15 seconds to lower it from top to bottom. 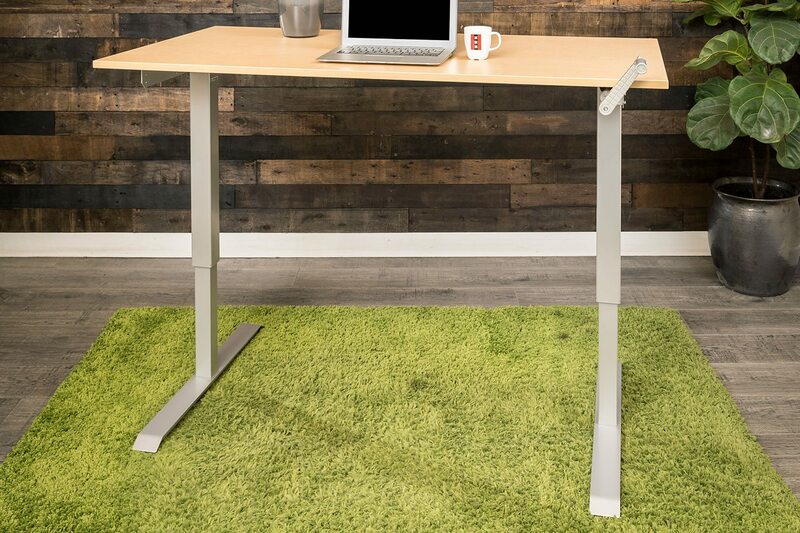 I'd recommend this to anyone that wants a good quality standing desk. Terrific Product, easy to assemble I workout in the morning then have to sit at my desk all day and was finding that my back, hips and legs were getting stiff. After a fair bit of research I bought this desk and it has exceeded my expectations. Packaging is solid and instructions are simple. Assembly is limited to the minimal required to ship. My 12 year old son and I put together in 2 hours with no frustration or confusion. The desk is solid and lives up to its description. An under-emphasized benefit (imho) is the ability to adjust in very small increments the height of the desk with the turn of the crank. This not only allows the desk to adjust to different chair / standing postures but lets you simply fiddle to reduce fatigue and muscle strain. Standing most of the day but having the option to sit has definitely re-energized my workday! Excellent for DIYers and people who need to work standing Very compact box and easy to assemble. In fact, I was impressed at how clear the instructions were. 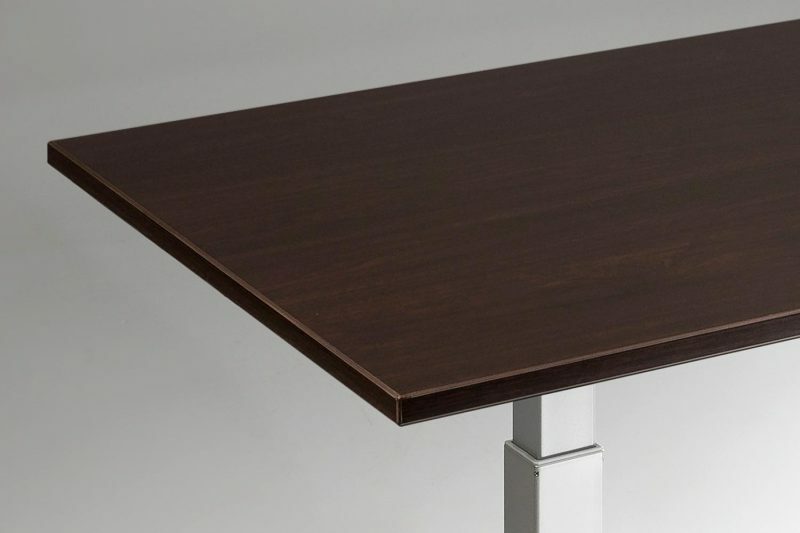 The table is very sturdy and well-built. I mounted a corner desktop on it which I bought at Ikea. 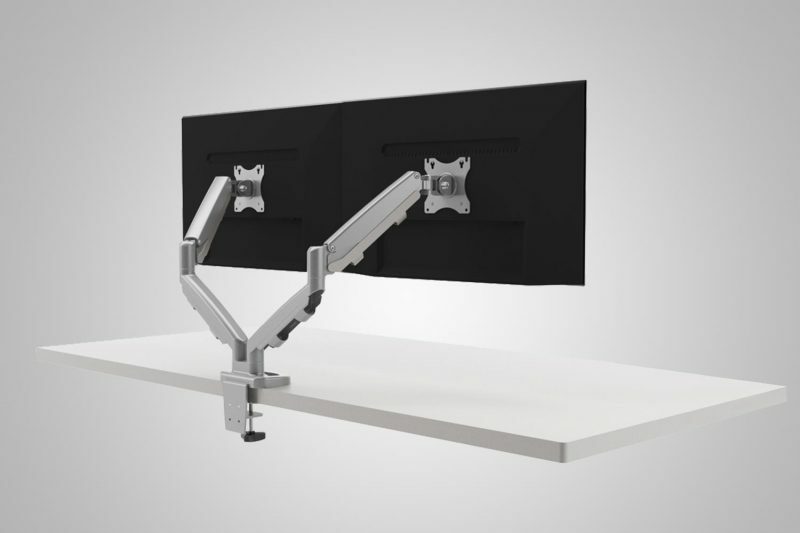 Be aware that the crank goes in just under the desktop height so if you use a non-rectangular desktop that comes out more than a few inches past the front of the frame, you won't be able to turn the crank. However, this isn't the table's fault; and I just put the crank in my drillgun and raised/lowered the table that way. I didn't want the electric version, as I don't expect to change the height often. I'd buy it again. Great packing, quality, and price Bought this for husband who works at home as software engineer. We assembled it in about 15 minutes. Getting table top on was a bit more work, getting holes to line up, but everything fit together nicely in the end. Husband loves it. Has Mac laptop and iMac with large monitor on it. No problems with stability. He cranks the table top up easily for hours at a time. 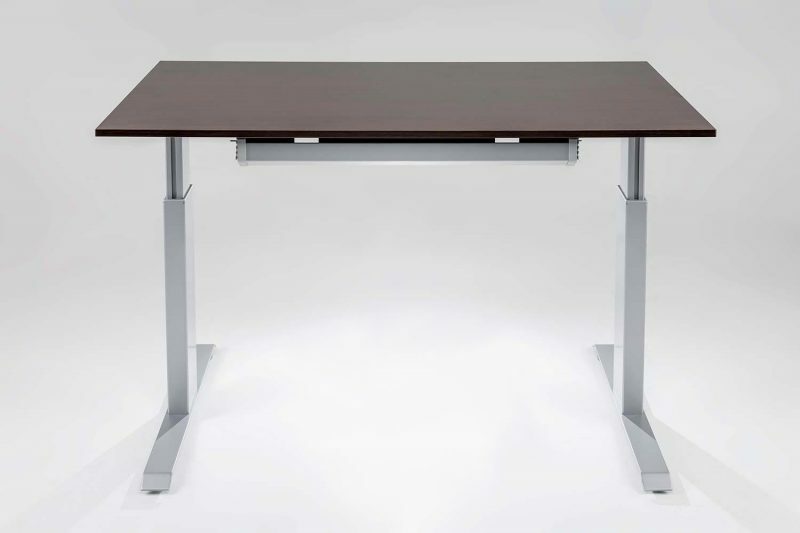 This desk saved my back This table is the perfect ergonomic device that will save your back. i've found most of my back aches stem from 8 hours of sitting down. The human body wasn't designed to be in a chair for 8 hours. I've found I've invested too much money on high end office chairs when the solution turned out to be an adjustable desk. Your core muscles will feel much stronger and your back will no longer be compressed at the lumbar region. I met these guys at the Dwell conference and tried the desk for myself. I went from a skeptic to a believer in a few minutes. I felt a lot more productive working in a standing position rather than a seated one. The better posture from a standing position helped me feel much more engaged and alert. I don't feel the lethargy from sitting on a chair all day. After decades of working at a traditional desk, i found the ability to adjust the heights rather invaluable. Some days I want to work standing up. Other days, I rather sit. The Multitable does both very adeptly. It takes seconds to readjust with the hand crank. it helps to change up your daily work position. I freaking love this desk. Solved My Problem and Looks Nice Too Pretty great product. Not cheap - but worth it considering there are very few others like this available. I bought just the base and installed my own matching chipboard top from Menard's ($10.00 - chipboard is fine if you are in this for the functionality of it and not picky, and also makes installing the top easier since you don't need to drill holes before screwing in). The small "set screws" that must be tightened, using the small allen wrench, are very tough to get in - I thought my little wrists were going to snap before the screws were fully tightened). Aside from that installation is pretty much a breeze and cranking the handle is great - takes a little effort of course but not bad at all. I move mine up and down 1-2 times per day. Took a really long time to ship - plan ahead and practice patience. LOVE it! I had expected to raise and lower the table quite a bit, but almost always leave it up high for standing. I am so much more productive now (I do computer graphics and video work). The table seems quite sturdy, even up high. I understand the earlier comments about wiggle, but I don't find it to be an issue. The only wiggle I find is when I built it (took about 30 minutes, by myself), and when I raise or lower it -- but it's not enough jiggle for me to worry about my large LCD monitor or glass lamp. Quality product, especially for the price, and I'm really enjoying the benefits of standing while working. Quality Desk, Serves its purpose Oh yeah this desk rocks. Make sure you tighten the screws really tight or you will have a little bit of a wobble. I'm 6' and this raises high enough to accommodate my height. :) There is a little wobble with the monitor on the desk when you raise it, but not enough to make it fall off. It lost a star because even though the crank can be removed, it's annoying to remove it and replace it when you want to adjust the height. It get's in the way of cords sometimes if you leave it on. But not a big deal. They say sitting is the new smoking so make sure you stand! Nice Table Popular with out library patrons. Our students are in various medical fields, MD, nursing, pharmacy, etc. The adjustable is a big plus for a varied group of people. Love this desk! I got this to experiment with a switch to a standing desk. 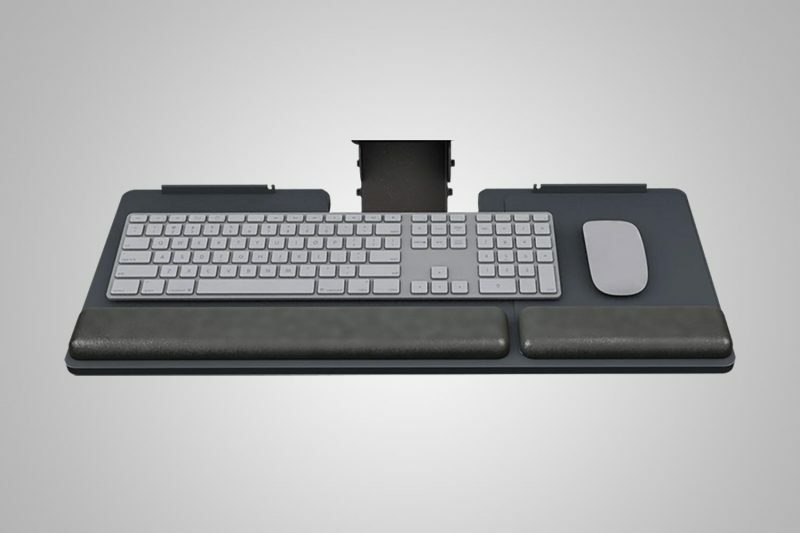 While I primarily stand now all the time- this gives me the option to crank the desk down if I need to sit for some reason, especially for meetings. The crank mechanism is smooth and solid, and even cranked to full-heights- the desk is very stable. A very solid, well-built product. Where has it been all my life? This is a gem. It is beautifully constructed, goes together with ease and operates like a dream. I bought it without the top and made a custom drawing board/shelves/ light table to go on it. Sometimes I crank it up and down just for the pleasure of experiencing how beautifully the mechanism works. I wish I had gotten one of these years ago. Great Desk, Excellent Service I bought the ModTable desk after sampling the standing-desk work experience using an improvised height extender that I placed on top of my existing desk. I liked the upright work posture, but found my kludge-job inconvenient because it was too difficult to rearrange stuff when I wanted/needed to sit back down. 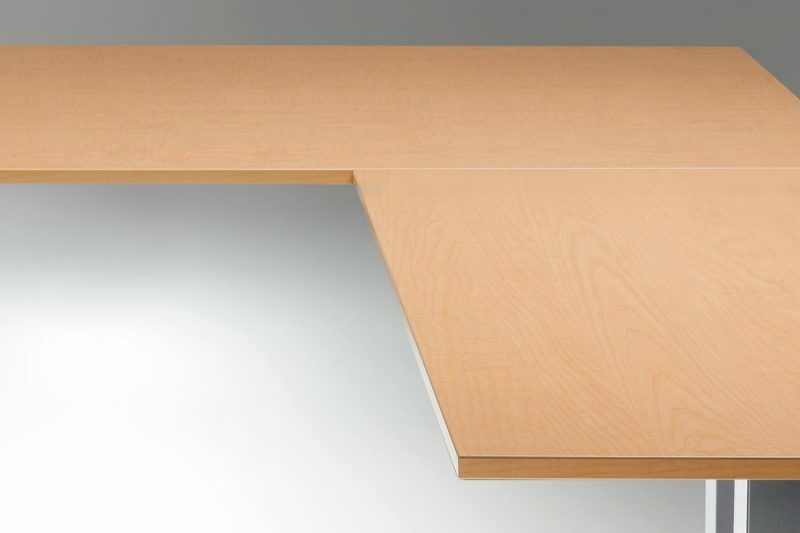 I ordered the ModTable manual adjustable height desk base plus a Medium-size honey maple finish top. The product arrived in two boxes: one for the base and one for the top. Base assembly was easy - the instructions are in English and are more clear than the ones that come with Ikea products. Assembly can be handled by one person. I had the base together fairly quickly, and all the parts matched up well and came together easily. However, when I went to attach the desk top to the base, I found that some of the pre-drilled screw holes had been placed incorrectly; they did not match up with the places where the base should attach. Fortunately, the screws are long enough that I was able to attach them in different spots, and the top feels solidly attached to the base. Were that not the case, I would have knocked some stars off my rating. The fully assembled desk is very nice. It looks handsome and feels solid. Even when raised to standing height, it is very stable. I can lean heavily on it and the top does not move a vertical millimeter. 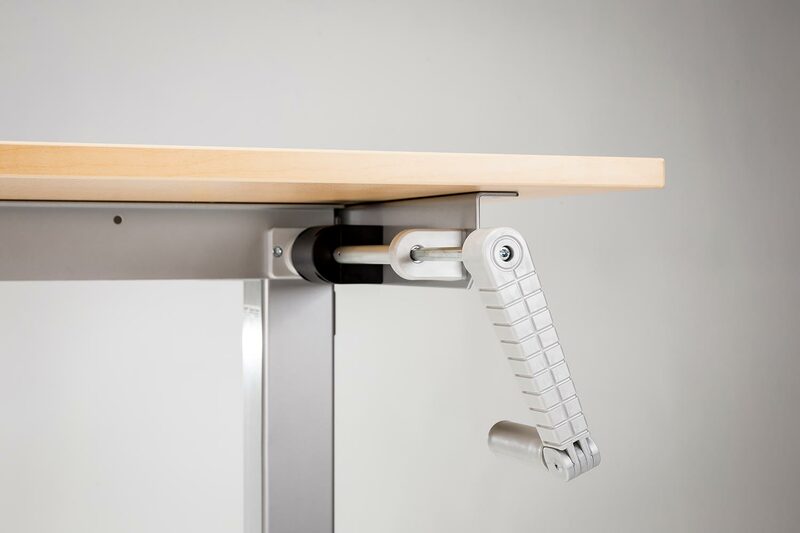 Plus, the crank motion is smooth and requires minimal effort even with a fully-loaded desk. 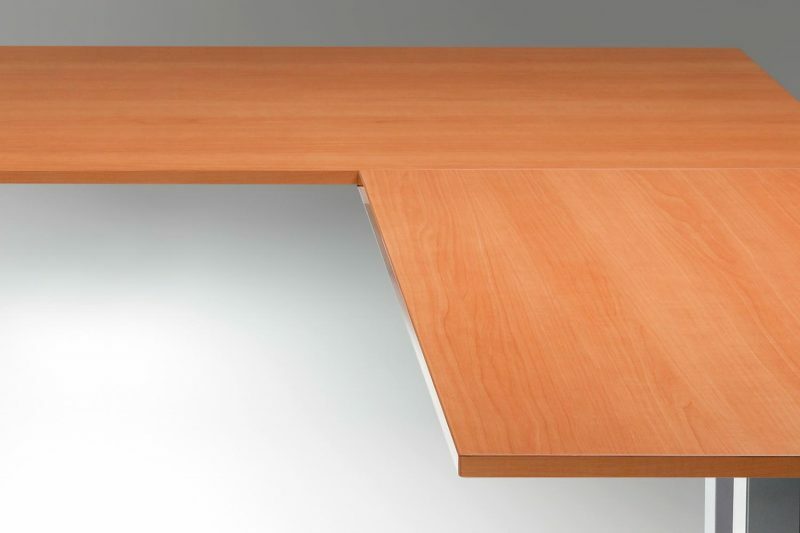 One consideration for prospective buyers: the Medium-size desk top has pretty modest dimensions. Check those dimensions before you order to be sure you'll have enough room for all your stuff. 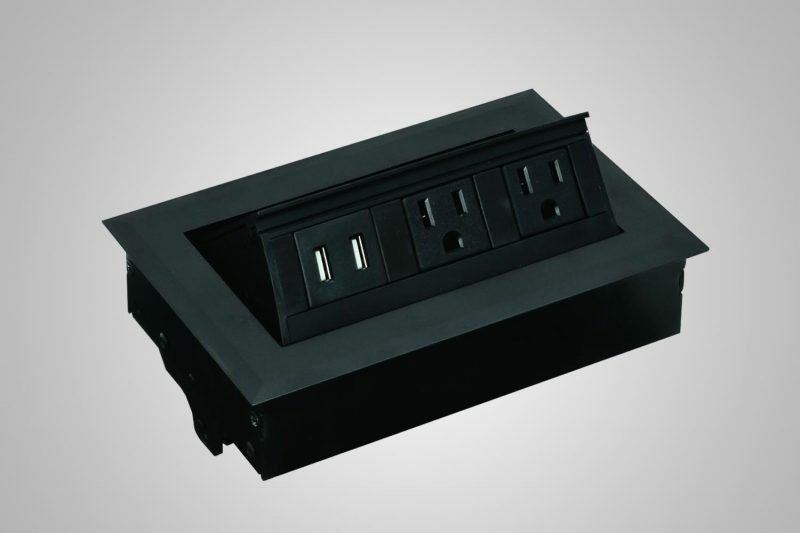 The base can adjust to fit larger desktops and is also sold without the made-to-fit top. I'm pleased with my ModTable so far, and I hope to get many years of work out of it. Perfect for those with back problems I bought this product mainly because it allowed me to stand will crafting. To be honest I wasn't sure what to expect since there were no reviews on Amazon yet. I was pleasantly surprised that not only did my back feel a whole lot better, I was able to get more done. The table is very sturdy as my cats who've jumped on top of it will attest too ;). I can use it for making cards, with embossing powders that require high heat, jewelry making, and embossing on metal with pretty heavy hammer. This table has withstood it all! The manual adjustable height is easy to use if someone else in your home needs to raise or lower it. (Which is why I wouldn't bother with the more expensive one that is motorized- it's more money for something that already easy to use). Another surprise was that I could store my plastic stacks of crafting drawers underneath it and still use a stool if I wanted! I love mine and would happily recommend it to anyone, crafters or not. Hope that helps you decide! Very Solid Sit Stand Desk After researching a ton of sit stand desks and seeing how expensive they were, I landed on the ModTable. I didn't want to spend an arm and a leg and didn't mind making my own table top. I grabbed an IKEA butcher block table top for $130 and made myself a huge custom top. this thing is nearly 6.5 feet wide x 4 feet deep and The ModTable has no problem cranking it up and down, with little wiggle on the way up and down. When it's in place it's solid as a rock. Setting it up was super easy and took about 45 minutes. The build quality is very solid for the most part. Everything is powder coated metal and the finish looks very nice. The only thing that was disappointing was the crank that you turn to get the desk up and down. There is a metal cylinder with a metal hex key that connects to a plastic crank handle. Well made plastic, but plastic nonetheless. This is the main piece you'll be touching multiple times a day to crank it up and down and it feels kinda cheap. For nearly $500 I would expect a metal handle. PROS: + Price compared to other sit stand desks is very competitive + Build quality is great with the exception of the plastic crank + The finish is a super nice matte black that doesn't scratch easily CONS: - Thing is still expensive as hell for what you get (no table top) - Plastic crank handle - Doesn't come with a top. Plan on spending an additional 100 bucks to get a table that doesn't look like crap. You're spending $480 on a desk so having a piece of particle board as a top would just be dumb in my mind. I get a lot of compliments on the table, but people are ALWAYS surprised when I tell them it costs nearly $500 for the metal parts. For me it's definitely worth it. I'm a normal height and weight 26 year old graphic designer and I typically stand for about 5 hours a day and sit for 3. This thing has made my back feel soooo much better. Sitting down is not good for you yadda yadda, but the fact is I feel much better at the end of the day if I stand for a few hours while working. Five Stars Works great & well built. Wonderful! My back and hips get tight and quite sore if I work in a sitting position for too long and, my feet don't like standing all day either. 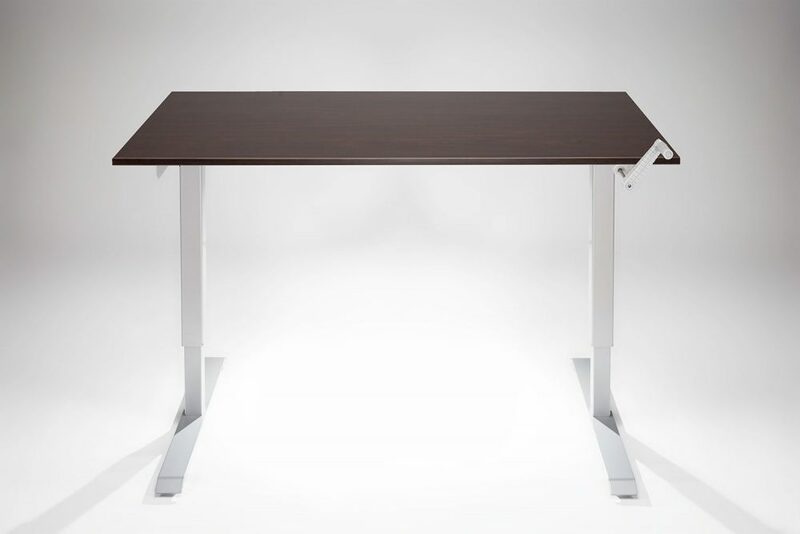 A mix of sitting and standing is perfect and your MultiTable desk allows me to do that easily. I ordered a second desk so that I can work at my computer at one of them and spread my research notes and sample drafts out on the other one...wonderful! Great! Great stuff. Thanks!! My osteopath called it Fantastic and assures me this is a positive step towards the next decade or so of living large, playing my sports pain free and avoiding a bad back... among other things. Get up and get engaged! We're loving the new table here at Bolster. We're a Brand Engagement Agency in Minneapolis and what better way to get active and engaged than to get up from your chair and groove while working. I've been using this all week long and love it. 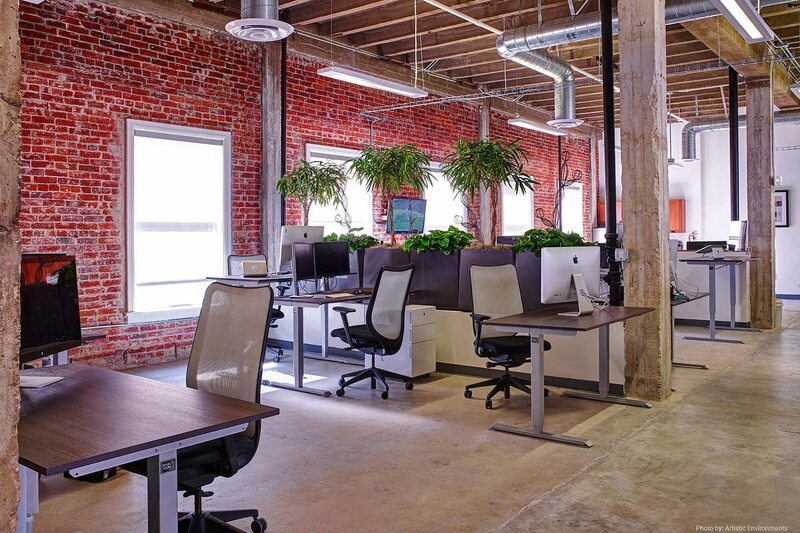 Also, we appreciate the build-quality and design that fits perfectly with our office aesthetic. Excellent Choice! I work from home and alternate between standing and sitting. The ModTable is strong enough to support the solid-wood top I have (from Ikea) and all my desk stuff, including a metal lamp and a cedar chest of drawers that's full of supplies. and I've been singing the praises of my ModTable. Some folks have even contacted me directly to ask about my experience (all good). Do yourself some good, order a ModTable! My name is Vincent Chacko and I decided to purchase a standing desk after hearing about all benefits about standing while you work. I work all day at a customer site as a contractor and unfortunately sitting is all they have there and the last thing I want to do is come home and sit down to catch up on personal stuff or other projects over the nights and weekends. Standing up and working has made all the difference. It provides more strength for my legs, more blood to my brain and easier thoughts to be formed whether I am solving technical problems, learning a new language online or just doing some personal browsing. I am a big proponent of change as a manner to create innovation and keep creativity moving and this desk has allowed me to do that. For my desk, I had an existing cube with complete metal structure that surrounded it that I used to sit behind. It was big, heavy and not conducive in any way to standing up. I decided to look into standing desks and after doing extensive research settled on the Multitable standing desk product. I also decided I would like to use the desk surface from the cube as my desktop as I love the surface and it fits the needs of what I do really well. I called Jacie and the folks at Multitable.com to order my desk and was blessed to receive an excellent, top notch, customer experience. They listened to what I wanted to do and supported me the whole way. They even shipped me another part and walked me through transforming my desk from a right hand operation to a left hand operation which then perfected my desk transformation completely. I also opted for the wheel kit and it has also made a big difference as I can move my desk around anywhere I choose within my office anytime I want. I cannot say enough good things about this company. In this dog eat dog, who cares about customer service world, I am blessed to find such caring and helpful people at a company with an equally amazing and valuable product. Do yourself some good, order there product. You will not be disappointed by the value you receive. Finally! I found a Standing Desk that doesn't break the bank! Finally! I found a height adjustable table that doesn't break the bank and that I can use as a writing desk in my home office. I'm a writer, and with the number of hours I spend at my desk every day, I needed something to combat the sedentary lifestyle. This is it! And thank you to everyone at MultiTable.com for your help from beginning to end. A very satisfied (and currently standing) customer. 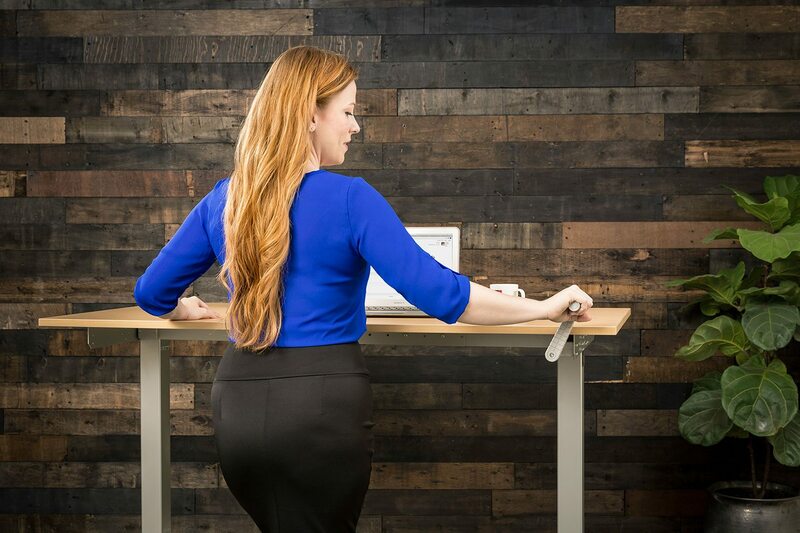 Meet The MultiTable® ModTable Standing Desk Frame, with years of 5 star ratings and a solid proven track record. An incredible DIY sit stand table frame at a reasonable price. Black & Silver ModTable Frames are back-ordered until late June.